One the most enjoyable parts of creating anything is the inspiration phase where we look for new and visually pleasing ideas to help us do our best. Inspiration awakens us to new possibilities and being inspired just feels good. When I am looking at a recipe, I am as interested in the inspiration behind the recipe as I am in the recipe itself. Knowing the story of the recipe, the creators intent and inspiration in turn leads to me feeling more inspired. 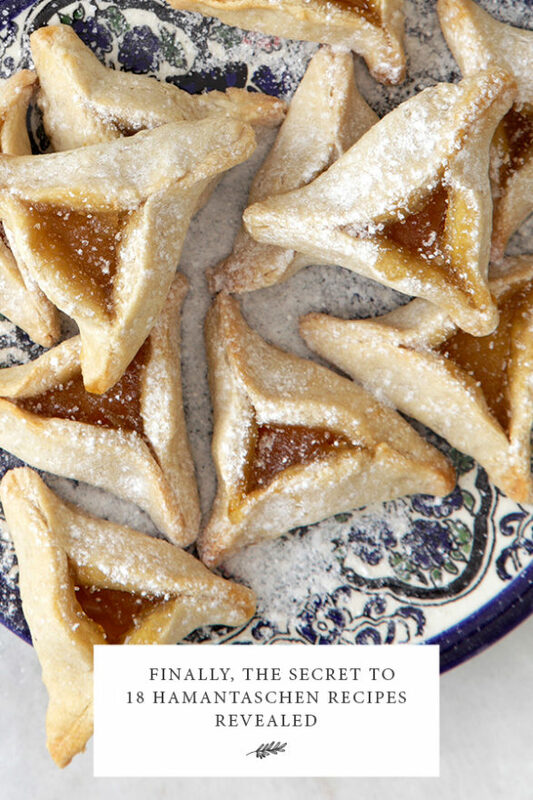 Here are 18 Hamantaschen inspired cookie recipes and photos to inspire us before Purim. Here is a yummy plant-based high-protein and low fat hamantaschen recipe that adults and children love. (Make a double batch of the filling). These gingerbread and apple hamantaschen are sweet and spicy. If you want to go the savory route, these savory Mediterranean hamantaschen look very grown up. If you love rice (like me) this creative sushi version would make for great appetizers. Try this spelt and red currant agave hamantaschen if you are looking to use a different type flour this year. If you are looking for a gluten free hamantaschen recipe, here is is. This fresh fruit variation looks elegant and fresh. If you are making cookies for a big crowd, here is a recipe that makes 60 hamantaschen cookies! If Jewish women could invent their own girl scout cookie flavor, I think this Double Chocolate Hamantaschen with Tahini + Caramel Drizzle would be a compelling entry. Seriously, why didn’t we think of combining rainbow sprinkles and hamantaschen a long time ago? Vegan Hamantaschen recipe that use Earth Balance. Traditional, old-school Hamantaschen recipe via Chabad. This recipe calls for homemade apricot jam and citrus marmalade filling. The author swears this Hamantaschen recipe was her mothers. Grain free Hamantaschen recipe for those who want a more “primal” purim. Super easy Hamantaschen recipe that kids can make easily. This hamentashen recipe is all about buttery taste, slightly crumbly, dough that have crisp edges. Your turn: Place your favorite hamantaschen recipe in the comments below.